It’s a new year! And it is so cold and dry in Kansas City! Brrr! Some of my favorite new products include a moisturizing face mask, bright eye shadows, a refreshing face mist, great new products from Yes to and a yummy sweet and salty snack. What are you loving this week? Leave me a comment and let me know. 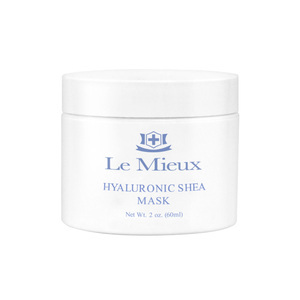 Le Mieux Hyaluronic Shea Mask ($15 USD) — Formulated with the moisture-binding hyaluronic acid, this deep conditioning mask prevents water loss, dryness and roughness, providing intensive, long-lasting hydration. A rejuvenating blend of soothing oils and botanical extracts deeply nourish dry, damaged and mature skin, while improving elasticity. What I think: My skin has been dry, but also really sensitive lately. I tried a different mask and it burned my face, so I was wary of trying another. But, I am so glad I tried this mask! It was so soothing and hydrating, and once I washed it off, my skin was so soft! I think I will be using this once or twice a week to keep my face soft and moisturized. Mehron INtense PRO Pressed Pigments in Fire ($52.95 USD) — are super long-lasting matte finish shadows that are edgy, bright, and sophisticated. Our pigment rich, high-performing shadows offer an essential range of intense hues and a velvety matte texture. Formulated without shimmer, these completely matte shades have an incredible silky finish which allows for amazing color payoff. 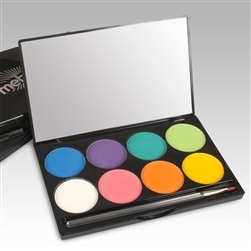 Fire Palette – includes the colors: Ignite, Purple Heat, Fire Island, Electric Green, Pure Lightening, Hot Pink, Inferno, and Yellow Spark. This also comes in Earth and Wind palettes. What I think: These shadows are so fun for a fresh look! Especially in this cold, dreary winter. The shadows are extremely pigmented and fun to use. I like to use them as an accent to more neutral shades. But using them together would be a very bright look! Phyto-C Icy Blue Mist ($40 USD) –Provides intensive hydration by binding water to skin tissue. Refreshes skin, nourishes dry and sun damaged skin. Enhances skin elasticity and radiance. Helps prevent irritation and other skin reactions. What I think: This is great tospritz on the face after washing and beforemoisturizers and during the day for a pick me up. It is very refreshing and smells minty! IngridNilsen x Yes to Cucumbers Facial Wipes -($5.99 USD40ct) — Yes To Cucumbers Hypoallergenic Facial Wipes gently remove dirt, sweat and makeup (eye makeup too!) without the need to rinse. Whether you’re out and about, going for a run, or having a late night, these wipes make it a snap to refresh on-the-go. Packed with greensuperfoods these all-natural, biodegradable wipes naturally exfoliate, detoxify, and rejuvenate all-in-one. Stay gorgeous, and go from zero to clean in seconds! Yes to Blueberries Face & Neck Oil ($15.99 USD) — Return your skin to 22! Imagine (really…close your eyes) a face oil that provides intense moisturization, absorbs quickly and won’t clog pores! Formulated with organic blueberries andL22, a botanically derived system which helps deliver the skin lipid profile of a healthy 22-year old. We couldn’t believe it either, but seeing (open those gorgeous peepers) is believing! What I think: I was so happy to test some new Yes to products, and these three were my favorites! The wipes are perfect for my sensitive skin and they clean very well. The lip oil is amazing! It smells and tastes fantastic, like coconut and mint and is so moisturizing. My lips were chapped by are much better after a few days use. And the face and neck oil keeps my parched skin soft without being greasy. Now for something different, and sweet. 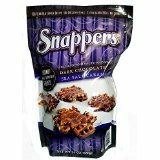 Snappers Crunchy and Salty and Sweet Dark Chocolate Sea Salt Caramel ($9.99 USD for a 24 oz. bag at COSTCO) — These are the perfect blend of smooth dark chocolate, creamy caramel, and crunchy pretzel topped with a hint of sea salt. What I think: These are so yummy! The crunchy pretzels topped with the soft caramel rich dark chocolate are paired with a pinch of salt. They are delicious and you need only one or two at a time to tame sweet cravings! Previous postJosie Josie Maran Argan Pure Complexion 5 Piece Collection is QVC’s Today’s Special Value For January 5, 2015!